Posted on April 8, 2018 by Smorgasbord - Variety is the Spice of Life. Welcome to the Open House Sunday Interview and this week my guest is Jo Clutton.. who manages two blogs covering her eclectic range of interests from travel and adventure to Wild West enactment. Before we find out more let me introduce her to you. I’m Jo – quirky artist, writer, traveller, mental health advocate, music lover, wild west nut intrigued by science. Renaissance soul with potty sense of humour. Pleasantly eccentric, I’m told. Five years ago I miraculously recovered from 30 years of depression over a period of three years. I’m blogging about the rebuild of my polymath life on Creating My Odyssey. Five years ago chance led Husband and I to the mental health team who brought me to where I am now. Which proves that provided sufferers of depression know where to look, help is available. That’s the hard part. My blog is a great vehicle for my creativity and life. I’m unleashing everything that was hidden under a bushel! I’ve been writing an epic Wild West novel forever, Alias Jeannie Delaney. Since my recovery I decided it’s time to get it out there. I’m blogging about it and Husband has taken me in hand and we’re slowly editing our way through it. Now time to explore Jo’s blogs further and discover what other adventures she would like to tackle in the future. Welcome Jo and could you tell us a little more about your two blogs? Creating My Odyssey is my creative mental health blog. I’m chronicling the rebuild of my polymath creativity and life after recovering completely from thirty years of depression and anxiety. My posts cover my renaissance soul lifestyle. Renaissance soul. What does that mean? It’s someone who has many disparate interests. Unrelated to each other. Polymath and scanner are other names for it. People who find it hard to settle for just one or two interests. Many years ago I decided that I was a renaissance soul. I listed my main interests as ‘artist, writer, traveller and wild westerner’. I loved that thought! Other interests that I write about are rowing, canoeing, the paranormal, architecture, archaeology, history of medicine and photography, space travel and research, films, reading, walking, yoga, archery and history. …a bonkers thing to do. it’s better to go to the zoo! a Levada is like a canal. it’s good to walk with a pal! they follow the lay of the land. hold onto the railings – both hands! My second blog, Kitty Le Roy is dedicated to my wild west hobby. I’ve been fascinated by the west forever, particularly the rough, tough, sharp shootin’ women of the west. I’ve researched many of these women over the years and did some living history camping in recent years, emulating my western heroines. 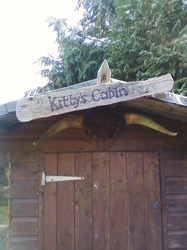 I have a cabin in my back garden. 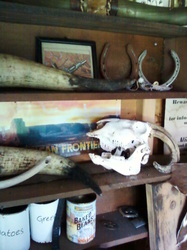 It’s well weathered now and filled with western artefacts (goat skull, steer horns, canned grub, whiskey bottles, art by me and western images). I’ve recently replaced the roof, with the help of JC, and intend, this summer to get it in shape again. This interest has ‘spurred on’ (sorry!) my epic novel writing Alias Jeannie Delaney, the life story of a devastating cowgirl who’s the fastest gun in the west and also bisexual. I’m working on this as we speak, with the help of Husband. I love films (action, comedy) and television (the same. quiz shows, who dunnits, antique shows, some comedy, Neighbours!) Of the action films that I enjoy I would probably choose Star Trek – any one of the series. Love the characters and the humour, quite apart from the action. Sally here: I have found this fight scene between Captain Kirk and Spock… I am a Trekkie..too. A lovely slice of Ham…..
Two big adventures! The first one is to snorkel the Great Barrier Reef. I love water, particularly the tropics, would love to see Australia (we have friends there), and always wanted to try snorkelling. I’d love to have been a marine archaeologist, diving down to wrecks, but the idea of deep scuba diving in a mask is particularly scary, so snorkelling will do nicely! And the second adventure would be to see the Aurora Borealis in colour. As I mentioned I have been writing Alias Jeannie Delaney forever, on and off for thirty years during depression and young parenthood to help keep me sane! My husband is finally helping me edit it chapter by chapter. I was too embarrassed by it before. I decided after recovering completely from depression that it was time to get it out there. I also want to extend my blog and post pieces about other creatives and renaissance souls. With such a wide range of styles to choose from I have picked a classic Western sound track from a film I am sure will fit in with Jo’s and Kitty’s love of the era. The Big Country. My thanks to Jo for joining us today and I do hope you will head over and enjoy her two blogs. Certainly plenty of interesting topics to enjoy for everyone. Just a reminder of the blogs and other places to connect to Jo. This entry was posted in blogging, Smorgasbord Open House and tagged Great Barrier Reef, Jo Clutton, Kitty Le Roy, Wild West by Smorgasbord - Variety is the Spice of Life.. Bookmark the permalink. Loved this interview. Great to meet Jo. You, too, Sally. It’s dull here but dry at the moment so might take the chance to visit the ospreys before it rains. I am impressed. I could never keep two blogs going. Hello Ibeth! 😃! My western website doesn’t get much attention really, which reminds me – time to attack it! It’s less a blog, more a website which I should attend to more often. Hi Marcia. Thank you so much. Funny, everyone’s enjoying the Levada poem. That was just a bit of fun when I had the flu! As to the zillion interests – can’t help myself! I’ve occasionally thought of cutting down, but that didn’t – and won’t- happen. Never! 😃 You’ve got hundreds, too, have you? Thank you for sharing Jo’s post Michael..
Nice to meet you, Jo! Good luck with your book! I love the Wild West as well! You’re welcome, Sally! You have a great week as well! Hugs! What lovely ladies you all are! Thank you so much for all your kind words. Now I’m under pressure to try and get on with the novel. It’s epic, a beginning, muddle and end, but my brilliant Husband is going through the editing process with me. It’s going to take a while longer, I suspect, but your comments will really help me along. Thank you!